The advanced Kodak 9000 3D system offers both digital panoramic and focused-field 3D imaging modalities. Using this technology enhances Dr. Johnson’s diagnostic abilities and broadens the range of treatments our practice can offer. The Kodak 9000 3D system produces images with details that a normal digital x-ray might not reveal. This system is rapidly changing the way we view our patients and the way radiographic examinations are conducted. Because caring for patients’ health is a Dr. Johnson’s top priority, the Kodak 9000 3D system was designed to adhere tightly to the ALARA principle, keeping radiation doses as low as reasonably attainable without sacrificing image quality. 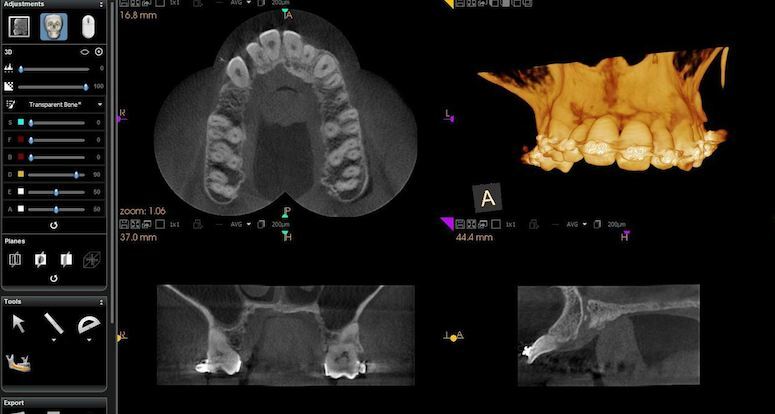 The patient dose for 3D CBCT volumes is within the range of one to five periapical film images. The Kodak 9000 3D system thus facilitates better patient care by providing more accurate and dependable treatment planning capabilities at a reduced patient dose. Patient comfort is also a top priority, which is why the Kodak 9000 3D system features an open, face-to- face design to facilitate patient positioning and allows users to maintain eye contact and ease patient anxiety. For panoramic imaging, it is a true “one size fits all” solution: the system’s variable focal trough adapts to each patient’s anatomy. The system accommodates patients of all shapes and sizes and is easily accessible to patients in wheelchairs.